American telecoms players continue to dominate the Brand Finance Telecoms 300 league table, with AT&T retaining the title of the sector’s most valuable brand, but most US brands experience a loss in value as they fend off competition from internet giants. Challenges presented by technology brands, such as Facebook-owned WhatsApp and Microsoft-owned Skype, have meant American telecoms must update their voice and video calling service offerings to stay relevant. Telecoms revenue growth has been in decline since 2013 as more customers opt for Over-The-Top (OTT) messaging services to remain in touch. With Microsoft (Skype), Facebook (Messenger, WhatsApp), Amazon (Alexa), Tencent (WeChat), Google (Hangouts) and many other firms expanding their services in this space, demand for OTT services is causing telecoms brands to adapt fast. However, 79% of mobile customers worldwide think that demand for OTT is outpacing the ability of telecoms brands to adjust, according to a 2017 Mobile Economy report by the GSMA. Nevertheless, when taking a snapshot of brand representation by country, the US still dominates as American brands hold the largest share or 28% of the total brand value in the Brand Finance Telecoms 300 league table. By comparison, China and Japan each account for 11% of the brand value in the telecoms sector and British telecoms brands occupy 8% of the league table. AT&T maintained its position as the leading telecoms brand in the world, despite its brand value falling 5% from US$87.0 billion to US$82.4 billion over the past 12 months. AT&T struggled with the loss of postpaid mobile phone subscribers as lower pricing for its unlimited plans failed to attract customers in a saturated US market. Looking to the future, the brand is now involved in new 5G network investments and participating in intensive testing for vehicle-to-everything (V2X) networks. America’s largest wireless network, Verizon, came in second place with a brand value of US$62.8 billion, down from US$65.9 billion last year, dropping 5% in brand value. Also placed within the top 10 in 6th spot is American brand Xfinity, the wireless and TV service owned by the wider Comcast network and valued at US$26.1 billion. Another American brand which has seen its brand value drop is independent business connectivity provider, Spectrum, which came in 12th place whilst contending with a 15% fall in brand value. The biggest success story from China in the Brand Finance Telecoms 300 league table is China Telecom which saw a 36% growth to its brand value, rising through the ranks to 7th place this year, from 10th last year. The brand is valued at almost US$24.0 billion. China Telecom is stepping up efforts towards 5G deployment, with plans to run a phased testing period for capacity and performance of 5G networks across six cities from 2017 to 2019 before launching commercially in 2020. China Telecom is also the country’s biggest fixed-line network services provider. China Mobile is ranked in 3rd place, with a brand value of US$53.2 billion, up 14% from last year, taking the title of most valuable telecoms brand in Asia. China Mobile boasts the world’s most extensive mobile network and the world’s largest mobile phone customer base. Its success can also be credited to the advanced moves it is making in the testing of single-carrier 400G Optical Transport Networking (OTN) - the first of its kind for domestic providers. China Mobile is also the strongest brand in the Brand Finance Telecoms 300 league table with a Brand Strength Index (BSI) score of 89.3 and a corresponding AAA brand rating. In the Middle East, Etisalat has been named the region’s most valuable telecoms brand for the first time. The Abu Dhabi-based operator has turned the dial up with a 40% increase to its brand value, cementing its place as a Strategic Enabler in the UAE’s digital transformation. Etisalat boasts an impressive AAA- brand rating and is the only telecom provider from the region to break the US$7 billion brand value mark. The key growth drivers behind Etisalat’s US$7.7 billion brand value include the brand’s innovative customer service-driven strategy, its leadership position on the 5G revolution, and successful launches of global brand-building initiatives. 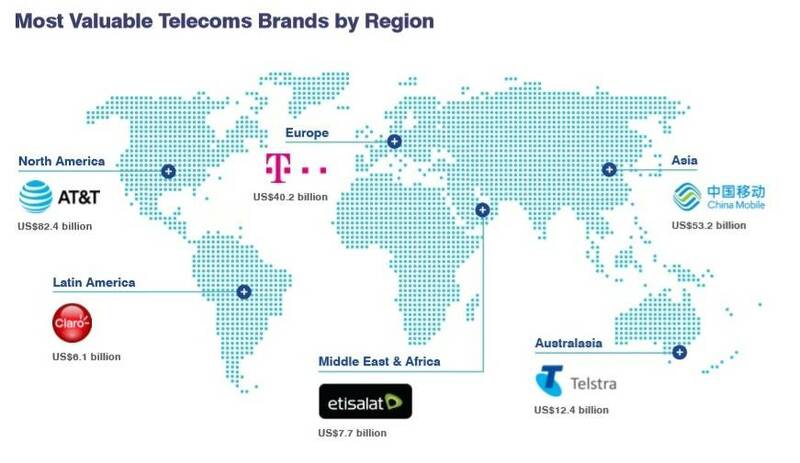 Deutsche Telekom achieved a 10% increase in its brand value over the last year, taking it beyond the US$40 billion barrier to US$40.2 billion. Its reputation as a reliable telecommunications provider in Germany has led to success beyond German borders, as it extends the business across Europe and North America. In Europe, the 5G revolution will be the next territory in which Deutsche Telekom could further dominate. Deutsche Telekom is not only building a reputation as a leading technology company which continues to invest in cutting edge infrastructure, such as the new fibre-optic cabling throughout its fixed network. It is also broadening its brand appeal by using the memorable magenta colour for brand communications, creating products and services, such as Magenta ONE and its fashion and accessories range. Claro is the most valuable telecoms brand in the Latin American region. Ranked 32nd and valued at US$6.1 billion, Claro has led its Mexican parent company América Móvil’s portfolio, which also includes Telcel (41) and Telmex (74), and has become the group’s first truly pan-regional brand. Claro operates in numerous countries throughout Central and South America as well as the Caribbean providing subscribers with a variety of telco services and high-speed mobile internet options. Alongside the 300 most valuable telecoms operator brands, Brand Finance has ranked the world‘s top 10 most valuable telecoms infrastructure brands in the Brand Finance Telecoms Infrastructure 10 2018 league table. Chinese brand Huawei comes out top in the Brand Finance Telecoms Infrastructure 10 league table, valued at US$38.0 billion, up 51% from last year’s US$25.2 billion. Huawei’s phenomenal global rise continues with its smartphone business now firmly in third place behind Apple and Samsung. The core networking business, which delivers the bulk of global revenue, is growing with the expectation of 5G services coming online soon. Since 2012, Huawei has grown nearly 700% from US$4.8 billion to US$38.0 billion, trailblazing Chinese efforts to build home-grown brands. Favoured Finnish brand Nokia is the third most valuable telecoms infrastructure brand worldwide, reaping the benefits of refreshing its well-loved mobile phones. Nokia’s brand story in the past few years can be likened to that of a phoenix rising from the ashes. Nokia has seen a 71% increase in brand value to US$8.4 billion in the past year, quadrupling since the low point of US$2.0 billion in 2014. Every year, leading valuation and strategy consultancy Brand Finance values the world’s biggest brands. The 300 most valuable telecoms operator brands in the world are included in the Brand Finance Telecoms 300 league table and the 10 most valuable telecoms infrastructure brands are listed in the Brand Finance Telecoms Infrastructure 10 ranking. More information about the methodology as well as definitions of key terms are available in the Brand Finance Telecoms 300 report. Data compiled for the Brand Finance Telecoms 300 league table and report is provided for the benefit of the media and is not to be used for any commercial or technical purpose without written permission from Brand Finance.